This lesson on guitar arpeggio technique is all about the physical application of arpeggios on guitar. 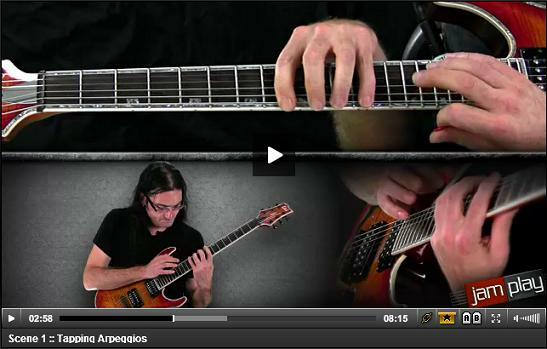 There are several ways you can play arpeggios - alternate picking, legato (hammer ons and pull offs), sweep picking and tapping. There are also essential lead techniques you should be confident with for playing arpeggios at higher speeds, such as string skipping and finger rolling. All the arpeggio techniques in this lesson will be covered in more depth in their own individual lessons, but hopefully by the end of this page you'll be more aware of the many different playing skills you can apply to your arpeggios. 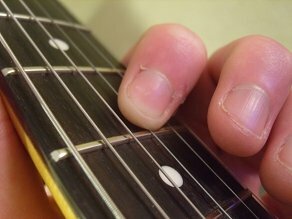 Rolling is a technique that allows you to play two vertical notes, on the same fret, in quick succession, using just one finger. How? By playing one note with the tip of your finger and the next note with the pad of your finger (or vice versa if you're descending the arpeggio pattern). To do this you need to work on collapsing and raising your top finger joints. The finger collapses or "rolls" back to a flatter position, fretting the string above and muting the string below. Many arpeggio patterns involve two "vertical" notes like this, in varying positions, so you need to ensure all your fingers can execute this rolling technique. Use the below exercise to practice this technique using all four fingers, starting with your index finger as pictured above. The tab shows the down strokes and up strokes we'd use to negotiate these note pairings. Rolling is especially important for sweep picking, as it's the only way you'll be able to play vertical notes like this at faster speeds. A lot of great guitarists use strict alternate picking for both scales and arpeggios. Alternate picking isn't the quickest, most efficient guitar arpeggio technique, but it's fine for styles where speed isn't such a big deal (i.e. if you're just playing quarter and eighth notes most of the time). A lot of guitarists choose alternate picking for consistency and control. String skipping allows you to play wide note intervals more economically. Using hammer ons and pull offs (known as legato - playing without picking) is another way of playing arpeggios faster and more economically, since we're not picking every note. A more advanced and difficult way to play arpeggios, but unmatched for speed when using a pick. Sweep picking involves playing two or more consecutive notes using a single picking direction in one smooth motion. 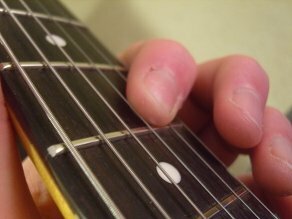 Another advanced technique, tapping is a form of legato playing where you hammer on and pull off strings using a pick hand finger (usually the middle finger). I hope this lesson has opened your eyes to the many different guitar arpeggio techniques you can use in your solos. If you want more exericises to improve your speed and timing, I highly recommend the Finger Trainer.